Strong gains in metal, energy, auto and power shares lifted the key indices to new highs. 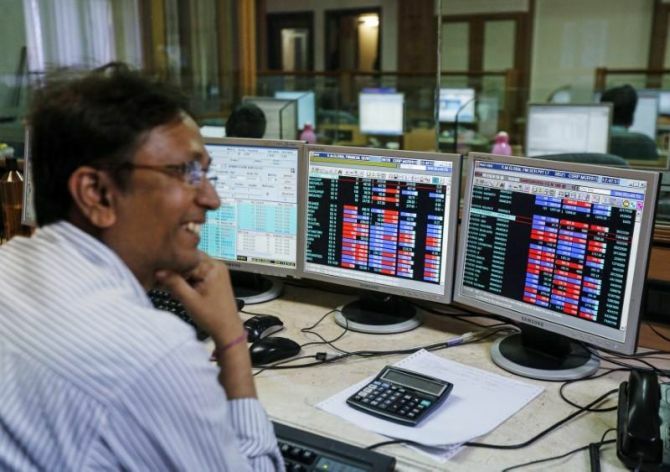 Market benchmark BSE Sensex rose by 202 points to close at a fresh record high while the NSE Nifty ended above the 11,700-mark for the first time led by gains in RIL, HDFC twins and Maruti. Continuing its record-breaking run for the second session, the BSE Sensex rose by 202.52 points or 0.52 per cent to close at a new all-time high of 38,896.63 after global markets rejoiced a trade deal between the US and Mexico. The 50-issue Nifty also advanced 46.55 points or 0.40 per cent to close at a record high of 11,738.50. It also hit a record intra-day high of 11,760.20, surpassing its previous record of 11,700.95. "Buoyed global sentiment on account of US-Mexico trade agreement elevated domestic indices to new highs," said Vinod Nair, head of research, Geojit Financial Services Ltd.
Asian and European stock markets climbed following another Wall Street record after the trade deal between the US and Mexico. Covering-up of short positions by participants ahead of August month expiry in the derivatives segment on Thursday too supported the bull-run. Adani Ports and Vedanta Ltd rose the most by 2.2 per cent among Sensex scrips. Vedanta Ltd on Tuesday bagged 41 out of 55 oil and gas exploration blocks offered in India's maiden open acreage auction. Reliance Industries breached the Rs 1,300-mark to hit a high of Rs 1,323 and finally settled 2.06 per cent higher at Rs 1,318.20. HDFC Bank and HDFC also advanced up to 1.48 per cent. Auto major Maruti rose by 1.72 per cent and Axis Bank by 1.62 per cent. Other prominent gainers that lifted both the key indices to a new lifetime high were Tata Steel, NTPC, Kotak Bank, Coal India, TCS, Infosys, Asian Paint, Tata Motors, Hero MotoCorp and M&M. However, shares of Yes Bank dropped 3.07 per cent, while SBI lost 1.07 per cent largely due to profit-booking. HUL, ONGC, ICICI Bank, ITC Ltd, IndusInd Bank, Bajaj Auto, Wipro, Bharti Airtel, PowerGrid and Sun Pharma too succumbed to profit booking. Fertiliser stocks turned buyers' fancy after reports said the subsidy is released the fertiliser companies once the bill is generated online. The payment is being done within a week now instead of waiting for months. Fertilizers & Chemicals Travancore (FACT), Southern Petrochemicals, Chambal Fertilisers & Chemicals and Madras Fertilizers increased up to 10.98 per cent. In the sector terms, the BSE metal index emerged top performer by gaining 1.89 per cent, followed by energy 1.16 per cent, auto 0.57 per cent, power 0.44 per cent, IT 0.44 per cent and teck 0.38 per cent. While PSU, consumer durables, oil&gas, infrastructure, realty, FMCG, capital goods, healthcare and banking indices ended in the negative zone, falling up to 1.13 per cent. The broader markets depicted a somewhat mixed trend with the BSE small-cap index rising 0.36 per cent, while the mid-cap index shed 0.35 per cent due to profit booking. Market breadth was also negative as 1,188 scrips advanced and 1,508 declined on BSE. As many as 174 scrips were unchanged. In the Asian region, Hong Kong's Hang Seng rose 0.28 per cent, Japan's Nikkei edged up 0.06 per cent, while Shanghai Composite shed 0.10 per cent. European markets too were higher in early deals with Frankfurt's DAX rising 0.20 per cent and Paris CAC 40 gained 0.14 per cent. London's FTSE rose 0.39 per cent.